Grand Beach Lakefront - 5 bedroom, 4.5 bath lake view home. Sleeps 14. 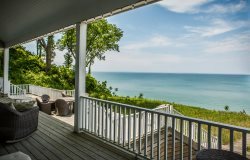 Luxury 5 bedroom 4.5 bath lake view home on Lake Michigan. Sleeps 14. There is only one word to describe this contemporary 5 bedroom, 4.5 bath lake view home with sleeping loft - SPECTACULAR! With its open concept floor plan and the enormous back deck with breathtaking views of Lake Michigan just beyond the spacious backyard, this home is sure to please. From the large front porch guests step into the main floor and are greeted by the glorious natural light pouring in from the multitude of windows throughout the living area, and the striking arched window in the kitchen area. The fully stocked gourmet kitchen features stainless steel and granite countertops, double ovens, 2 Bosch dishwashers, a huge refrigerator, and a magnificent island with a bar sink and breakfast bar seating for 4. The stylish living area is furnished with comfortable couches from which to to gaze at the lake or lounge by the gorgeous wood burning fireplace. The two spaces are separated by a rustic dining table with seating for 10. Off of the living area is the master bedroom, which boasts a king size bed and full en suite bathroom with a walk in shower, jacuzzi tub, and double sinks. In addition, the master bedroom has private access out to the back deck and a separate living space with ample seating and a TV. Also on the main floor is a powder room and washer/dryer. The lower level consists of a bright and cheery family room equipped with games, puzzles, and a large flat screen TV. Guests can use the separate entrance and bathroom with shower to rinse off the sand before heading upstairs. The upper level contains 4 delightfully decorated bedrooms and 2 bathrooms. Two of the bedrooms enjoy lake views and queen beds. The third bedroom has two twin beds and the fourth bedroom is a semi private room with a queen bed. From the upper floor guest can overlook the main floor via a balcony. A spiral staircase leads up to a loft area. With a full bed, a twin bed, and twin bunk beds, this room is perfect for older children and young adults. We thought Mary Lambert was great! Responsive, professional and on top of their game. They know the area and their properties inside out. I've been renting large, high-end vacation homes for trips and events for 16+ years. The Yellowbird staff ranks among the very top...thorough, professional and diligent in delivering an easy, Hasselbring-free experience.